InMobi Technologies Pvt Ltd seems to be heading for a challenging period as a top client has reduced spending on its mobile advertising platform. InMobi CEO Naveen Tewari said at a recent townhall interaction that Finnish games developer Supercell has cut its mobile advertising spend with InMobi, a person familiar with the development told Techcircle.in. The person said that Supercell, InMobi’s top gaming client, may eventually stop working with the Indian mobile advertising firm. However, InMobi said that Supercell remains a strategic client. “Today, there has been a change in Supercell's global marketing strategy that has resulted in them re-looking at their (advertising) spends across all channels, and this decision is not restricted to InMobi alone,” Tewari said in response to a Techcircle.in query. He added that only last month a team from SuperCell visited InMobi’s Bangalore office and spent an entire day with all its teams. Supercell, a mobile and tablet games developer owned by Japanese internet conglomerate SoftBank, has developed about 165 games such as Clash of Clans, Boom Beach and Hay Day across 12 different platforms. Clash of Clans is the top-grossing mobile game in the world. InMobi is the world’s third-largest player in the fast-growing mobile advertising industry, with only Facebook and Google ahead of it. InMobi, which has a global turnover of more than half a billion dollars, didn’t quantify Supercell’s contribution to its revenue but played down the impact of the Finnish company’s budget cut on its performance. “In a sector where all advertisers are clamouring for more inventory to advertise in, the loss of one particular advertiser results in inventory becoming available for others,” Tewari said. “We have seen growing interest from advertisers across diverse sectors including commerce, travel, utilities and entertainment to work with us. Over the last few months, hundreds of advertisers have signed up with InMobi, many of whom have scaled up spends significantly,” he added. 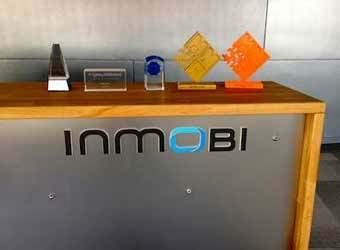 InMobi has worked with marquee names such as Yamaha, Canon, Adidas and BBC Radio, among others. While mobile advertising spend is expected to hit $42 billion by 2017, analyst firm Gartner recently suggested that a slowdowncould be around the corner. "Over the next few years, growth in mobile advertising spending will slow due to ad space inventory supply growing faster than demand, as the number of mobile websites and applications increases faster than brands request ad space on mobile device screens," said Stephanie Baghdassarian, research director at Gartner. Set up in 2007, Bangalore- and San Francisco-based InMobi’s platform enables brands, publishers and developers to engage with consumers globally through mobile advertising. It has 24 offices in 17 countries. The company is backed by investors such as SoftBank Corp, Kleiner Perkins Caufield & Byers and Sherpalo Ventures. InMobi raised about $200 million from Japan’s Softbank Corp in 2011, which was to be infused in two equal tranches in September 2011 and April 2012. News reports say it recently raised $100 million in fresh debt from a consortium of lenders led by US-based Tennenbaum Capital Partners.